Seraphine – No longer preggo, gotta go. Organic Gardening – Didn’t sign up for these, although it sounds cool. Swiftpage E/Pumpone – Seriously, no idea what this even was, glad it’s gone. Outer Banks Sporting Events – Been getting theses since my first marathon! Pinterest – I’m not that into pinteresting. WHRO – I don’t need news about the news. Prevention – What the heck is this? Antiques Roadshow – I signed up to win tickets, not a mess o’ emails. World’s Best Cat Litter – A little embarrassed about this one. Project Feederwatch – Sorry birdies. Food Lion – The worst email offender. Zulily – Tied with the worst email offender. It’s amazing the shameless groveling and lengths these companies will go to to orchistrate your unsucessful unsubscribing. Tricky pre-checked off buttons that say “It’s not too late to change you’re mind” and “On second thought, include me in promotional emails” that look like you’re doing something other than unsubscribing abound. Some show you the same screen twice, always with the options you don’t want checked…I’m assuming because they know how “double click” happy we all are…if you double click “save” you’ll be right back where you started…getting their emails. And almost all had the perennial “please click here to continue shopping.” I wasn’t shopping, thanks. No second thoughts and careless double-clicks here. Sayonara. The ones I couldn’t bring myself to completely unsubscribe from because I do actually use their offers sometimes for sales, inspiration, and such (petfood, World Market, Groupon), I created a filter called “Almost Junk” in which they will be shunted. Then, if I have a mind to go buy something at Michael’s or order one hundred pounds of dogfood, I’ll check that folder for the most recent deals. I’m feeling cyber-lighter already! Ack! Don’t forget to label bottles! Our car is a mess. A complete mess. Whenever we drive to see either of our parents, I always make sure that I clean it out for fear of one of our moms saying “Wow, you really need to clean out your car!” It’s not disgusting/unsanitary – no moldy growths from food scraps or anything – just full of papers, junk mail, an empty seltzer can or 5, coffee mugs, etc. So before we pack up the car with 13 loads of laundry, I go outside with 2 bags – one for the recyclables and one for the trash. Which normally turns into 4 bags. Sometimes 7. And then 2-3 trips back to the house carrying in coffee mugs or water cups. But it’s “clean.” I never have time (or the desire) to vacuum, wash the windows, wipe the dash, hose off the rubber floor mats, etc. Getting the trash out is enough. So the other day, L decided that while I was working with one eye on my computers and the other eye on WV she would REALLY clean out the car. She removed ALL of the crap that was inside, vacuumed, washed windows, the whole works. The only thing she didn’t do was wash and wax the exterior (lazy, right?). She even found a bottle of windshield washer fluid and refilled the reservoir because it was bone dry! What a keeper! I didn’t even think we had any washer fluid because I distinctly remembered finishing off a bottle last summer and didn’t recall going to the store to buy more. 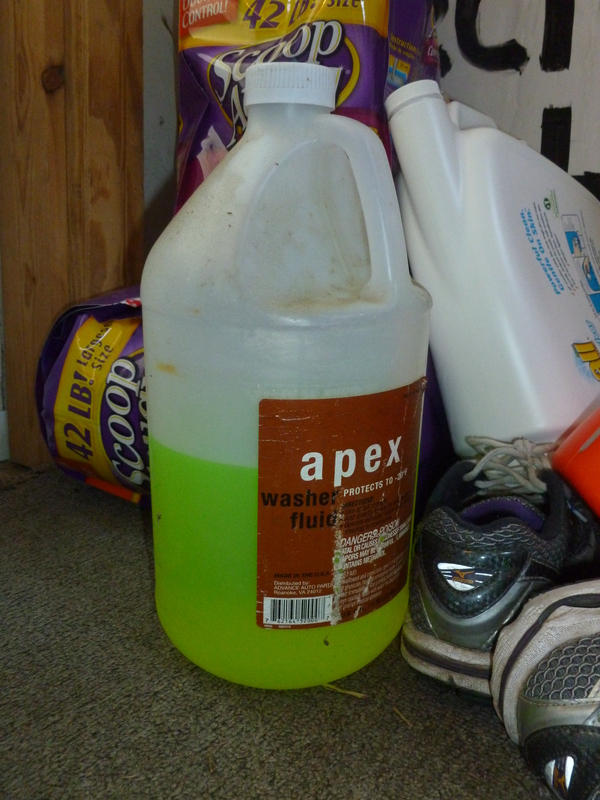 Later that night, I took the dogs out for a walk and noticed a windshield washer fluid bottle on the floor of the entryway that had a tiny, tiny bit of a fluorescent yellowy liquid in the bottom of it. While we were on the walk, the wheels in my head began to turn. I’ve never seen fluorescent yellowy windshield washer fluid. And as mentioned before, I didn’t even think we had any. What could it be? I got back from walking the dogs, then came upstairs to tell L my discovery. She was feeding WV, and I walked into the room and said “I made a mistake a while ago that you unknowingly perpetuated.” She was completely confused and had no idea what I was talking about. I explained to her the situation, and that it was entirely my fault, that I should have labeled the container. She felt so bad though. She had been extremely helpful in cleaning out the car, and then going above and beyond to refill the washer fluid reservoir! How was she supposed to know that the liquid inside the bottle that said windshield washer fluid was not, in fact, windshield washer fluid? I did a quick search to see if anyone had done this before and what could be done to fix it. I was prepared to completely disassemble the entire washer fluid system. Most of the posts in the search results were of the opposite problem – washer fluid in the coolant overflow reservoir. But nestled in the second page of results was a little post from our friends at Car Talk explaining what to do. Click and Clack save the day, again! So the moral of the story is that communication is key. Whether it’s written or verbal. Or nonverbal, for that matter, if you’re competent enough to know exactly what your wife is thinking without her having to say it. It would have taken me mere seconds to cross out “Windshield Washer Fluid” and write “50/50 Antifreeze” on the bottle, and would have saved a lot of time (not to mention the antifreeze/water mixture that I took back to the auto parts store for proper disposal). Could I have used that fluid again, or was it more advisable that I take it back to the store for disposal? Q: What’s the last thing that goes through a bug’s mind as it crashes into your windshield?